Above is a species of wasp called Megischus maculipennis. 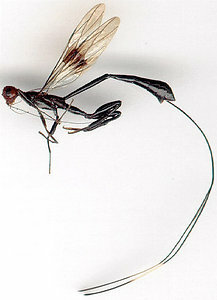 M. maculipennis belongs to the superfamily Stephanoidea – which are considered to be an ancient group of parasitic wasp. Today there are 323 living species in 11 genera. 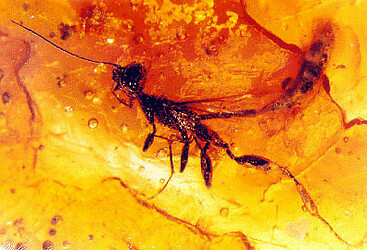 there are also 3 genera known from baltic amber. Stephanids live mostly in tropical forests, but many inhabit desert or semidesert areas …, reach high latitudes (e.g., Megischus bicolor in Canada, Stephanus serrator in Germany, Hemistephanus artiosulcatus in Argentina), or are endemic in many oceanic islands throughout the world. The genera are normally restricted to one or two particular zoogeographical regions, such as Hemistephanus (Neotropical), Parastephanellus (Oriental and Australian), and Foenatopus (mostly Oriental and Afrotropical). No stephanid species, except for one introduced taxon, has been found in more than one zoogeographic region, suggesting a considerable degree of endemism … There are no species of stephanids known from Chile. Adults seem to be predominantly diurnal, but some species are attracted to light traps …, suggesting that flight activity may start in, or extend to crepuscular hours. Flight and other movements are usually slow and weak, but cryptic coloration and behavior contribute to make many species inconspicuous in their habitat.